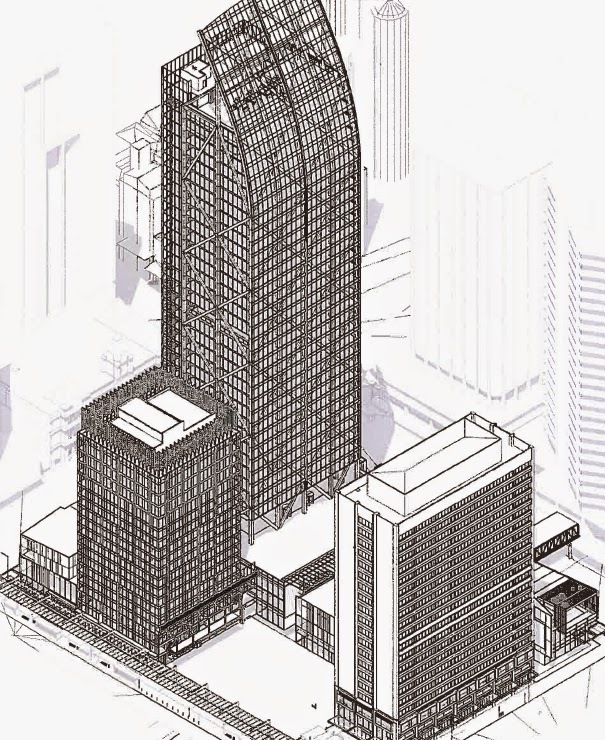 This 3D view diagram of a Precinct Property proposal for the re-development of Auckland's Downtown area (which shows Queen Elizabeth Square) is included in the information being considered today, under urgency, by the Chair, Deputy Chair and another Councillor who are members of Auckland Council's Hearings Committee. Also included in the information is this 3D diagram of how the area looks today. The Hearings Committee are asked to make decisions about the appointment of an independent commissioner who will be asked to decide whether the resource consents applied for, and that are necessary for the development, should be publicly notified. Or not. And if not, that commissioner will be expected to make decisions on those resource consents alone. (As happened with the Bledisloe Wharf extensions for example). If the commissioner decides that the applications should be notified, then that commissioner will be joined by three more commissioners who will then make decisions after notification and related hearings of submissions. 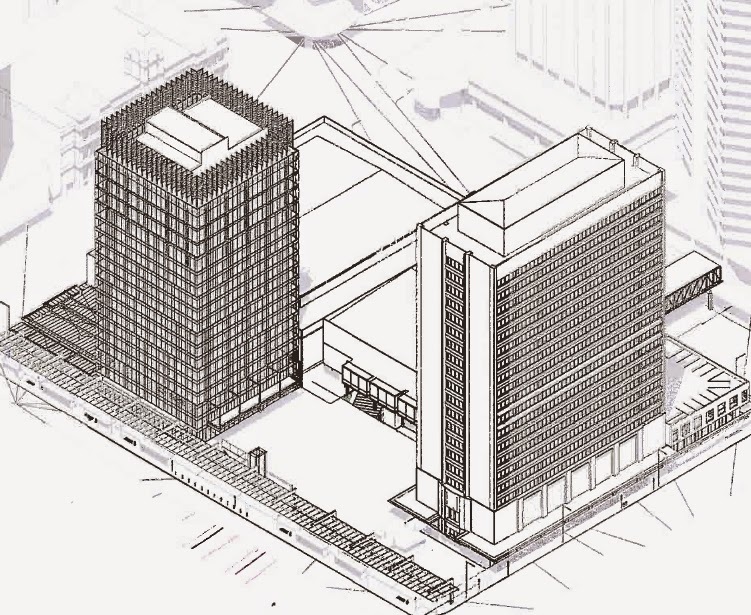 On the face of it - looking at these diagrams which are the only information about the application contained in the report being considered today by the 3 members of the Auckland Council Hearings Committee - it looks as if all of Queen Elizabeth Square is being retained as an open space. And that its edges will be activated by the proposed development. Also that a laneway will connect Queen Elizabeth Square through to Lower Albert Street. Other features of the development that are worth knowing more about include what is proposed at the corner of Custom Street and Queen Street, and at the corner of Quay Street and Albert Street. And of course the tower. It is very large and dominating. What this report does not say is who owns Queen Elizabeth Square. It does say that Precinct will be building car parks beneath part of Queen Elizabeth Square. That was predictable - given that the original resource consent obtained by previous owners Westfield - provided for several levels of basement parking - some of which have been lost because the Central Rail Tunnel passes beneath the tower. 1) I note that the Authorisers and Authors of this report include the same Penny Pirrit who was part of the Auckland City Council team that granted the original non-notified consent to Westfield in 2008. (One blog about this is: Downtown Deal Plot Thickens) Also part of the team today is the same senior planner. The continuity of council planning from the bad old days of Auckland City Council is alive and well in Auckland Council today. 2) I suspect the Auckland Council Hearings team will be delighted and relieved to see Queen Elizabeth Square untouched in the Precinct proposal. Certainly I am. But is it what it seems? Why release only this image - without also explaining and clarifying the final deal. 3) The package of consents applied for have been divided into two chunks - above ground and below ground - all part of the same application. That makes sense. The preliminary report from Auckland Council officers advises that some of the above ground activitiesfor which consent is sought are "non-complying", and some below ground are "discretionary". With any luck you'd think a commissioner would take that, and the public interest that has been generated, as a signal that these consents should be notified. 4) However, even if they were notified, this is clearly a Public-Private-Partnership. It is a Public-Precinct-Partnership. The applications appear to only relate to what Precinct Properties would like to do on its land, under its land, and under some public land. They don't appear to relate at all to the public part of the partnership - except in so far as there will be urban design questions about the interface between buildings and public domain. 6) The risk with the Council's current approach - exemplified in its determination not to notify projects such as the artwork on Queens Wharf - is that it will only satisfy private sector needs and Council's insatiable thirst for increased revenues (from land sales, development levies and increased rates). 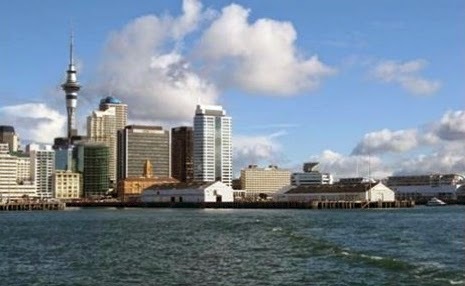 The public's right to its city and to public spaces and places that are public and which meet the varying needs of the changing Auckland waterfront visitor demographic (families, kids, young people, pensioners .... and so on), is again at risk of being short-changed. 7) This is a joint Downtown application. Be honest. Its Council and Precinct together. Normally I would expect a plan change. Like we saw for Wynyard Quarter. That's the honest and open and systematic way of allocating land uses and planning for public and private outcomes. There is a smell of incrementalism about this process which is disturbing. Council owes Auckland citizens an explanation and reassurance. If you look closely at this picture of Queens Wharf you will notice that Shed 11 is still there and hasn't been dismantled to make way for the Rugby World Cup Party Central structure. This picture is from Heritage New Zealand's website and illustrates its description of a recent historic places list entry entitled Queens Wharf, Quay Street, Auckland. Queens Wharf, "includes part of the land described as Pt Lot 37 DP 131568, North Auckland Land District, and the buildings and structures known as the Queens Wharf thereon, and their fittings and fixtures" is, since December 2010, listed as a Category 1 Historic Place. This is a recent addition to the Historic Places List which, as a matter of interest, also includes the Quay Street Historic Area (described in the listing as: "This area extends along the south side of the original settlement of Quay St East (the area east of Britomart Pl was extended and handed over to the Auckland City Council in 1914.)"). The Quay Street area was added to the Historic Places list in 1994 as a "Historic Area" and is referred to in relevant Town Planning documents. I was an ARC councillor at the time the debate over Queens Wharf was raging between 2008 and 2010. Many will recall the debate over whether the Sheds should be demolished or not. Shed 11 was eventually saved from demolition (it was carefully dismantled and is stored somewhere) but Shed 10 remained and has been adaptively renovated consistent with its heritage status. One of the key documents that was commissioned during this debate was a Heritage Assessment of Queens Wharf and the Sheds which was conducted by Matthews and Matthews. You can download it here. At the time I was mainly interested in what it had to say about the Sheds (it supported their retention). But a confidential ARC report written later, around the time Councillors were deciding on arrangements with Ports of Auckland Ltd in respect of Queens Wharf (POAL wanted rights retained to berth ships on the long sides of Queens Wharf - but not the end - which was to be kept free for public access and enjoyment) noted that the Heritage Assessment report made a number of other specific recommendations about the wharf, in particular that views of the Harbour from Queens Wharf, and from the Harbour of Queens Wharf, had heritage status. The text goes on to describe the landmark significance of Queens Wharf, its structures, and relationship with the Ferry Building. It mentions other historic wharves and notes its relationship with the Britomart area. The Matthews and Matthews report was one of the influences when the Historic Places Trust investigated Queens Wharf and made its decision to list Queens Wharf as a Category One Historic Place in December 2010 just a couple of months after the SuperCity was established. Was this listing taken into account when the B2 and B3 wharf extension applications were processed by Auckland Council? I note that the planning reports and officer assessments of the Ports of Auckland Ltd proposed B2 and B3 wharf extensions do consider the visual effects on Quay Street - in accordance with the Auckland Regional Plan Coastal provisions. But there is no mention of the Historic Places Trust being treated as an affected person who should be notified because the B3 extension in particular would partly obscure this historic landmark when viewed from the sea, and would obstruct heritage views of the Harbour from Queens Wharf. Nor is there any mention of the fact that having a Category One Historic Place adjacent to the proposed POAL development might conceivably constitute a "special circumstance" triggering the need to notify the applications. Is this another public policy that was conveniently forgotten during amalgamation and was not on the desktop when planning reports were written? Does the Proposed Auckland Unitary Plan appropriately provide for this 2010 change in the planning status of Queens Wharf? If we can't rely on our Council to protect the public interest in looking after and respecting historic places, who can we trust?